Obama's odd obsession with universal nuclear disarmament. Obama’s odd obsession with universal nuclear disarmament. Still, someone has to say it: Some things went well on this trip, and some things went badly. But the centerpiece of the visit, Obama’s keynote foreign-policy speech in Prague—leaked in advance, billed as a major statement—was, to put it bluntly, peculiar. He used it to call for “a world without nuclear weapons” and a new series of arms-control negotiations with Russia. This was not wrong, necessarily, and not evil. But it was strange. Clearly, the “no nukes” policy is one close to the president’s heart. The Prague speech even carried echoes of that most famous of all Obama speeches, the one he made after losing the New Hampshire primary. “There are those who hear talk of a world without nuclear weapons and doubt whether it is worth setting a goal that seems impossible,” he told his Czech audience. (Remember “We have been told we cannot do this by a chorus of cynics”?) “When nations and peoples allow themselves to be defined by their differences, the gulf between them widens,” he continued. (“We are not as divided as our politics suggests.”) He didn’t say “Yes, we can” at the end, but he did say “human destiny will be what we make of it,” which amounts to the same thing. The rhetoric was his—as was the idea. Look at his record: One of the few foreign-policy initiatives to which Obama stuck his name during his brief Senate term was an increase in funding for nuclear nonproliferation. One of the few senatorial trips he managed was a nuclear inspection tour of Russia, Ukraine, and Azerbaijan. This is all very nice—but as the central plank in an American president’s foreign policy, a call for universal nuclear disarmament seems rather beside the point. Apparently, the president’s intention is to lead by example: If the United States cuts its own nuclear arsenal and bans testing, others will allegedly follow. Forgive me for joining the chorus of cynics, but there is no evidence that U.S. nuclear arms reductions have ever inspired others to do the same. All the world’s more recent nuclear powers—Israel, India, Pakistan—acquired their weapons well after such talks began more than 40 years ago. As for the North Koreans, they chose the very day of the Prague speech to launch (unsuccessfully) an experimental missile. In its wake, neither China nor Russia wanted to condemn the launch, since to do so might set a precedent uncomfortable for them. “Every state has the right to the peaceful use of outer space,” said a Russian U.N. envoy. His government does want arms-reduction talks, it is true, but only because the Russian nuclear arsenal is rapidly deteriorating. By agreeing to start them, we’ve unnecessarily handed over a bargaining chip. More to the point, nuclear weapons, while terrifying in the abstract, are not an immediate strategic threat to Europe or the United States—even from Iran. Biological weapons are potentially more lethal. Chemical weapons are far cheaper to produce. Within the United States, ordinary bombs and rogue airplanes have already caused plenty of damage. Conventional weapons, meanwhile, have not gone out of fashion. The most recent use of military force in Europe—the Russian-Georgian conflict of last August—involved tanks and infantry, not nukes. Even if Russia sold its remaining nuclear weapons for scrap metal, Russia’s military would still pose a potential threat to its neighbors, just as a China without nukes could still invade Taiwan. Ridding the world of nuclear weapons would be very nice, in other words, but on its own, it won’t alter the international balance of power, stop al-Qaida, or prevent large authoritarian states from invading their smaller neighbors. However unsuccessful it has been so far, the promotion of democracy around the world is, ultimately, the only way to achieve these goals. 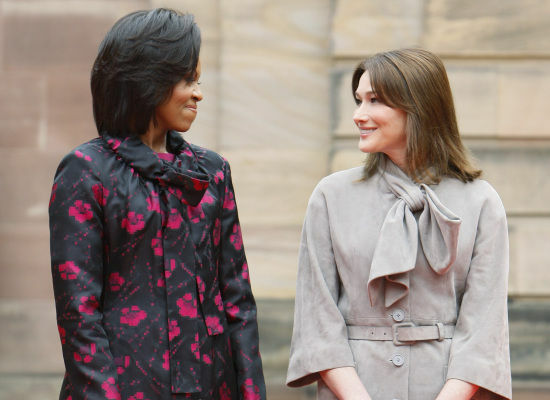 Besides, however much the French loved Michelle’s flowery dress, I’m not sure they have much interest in giving up their force de frappe. Ditto the British. And since they don’t pose a threat, to us or anyone else, it’s not clear to me why we should waste diplomatic capital trying to make them do so. It could be, of course, that the Prague speech represented a holding pattern: Obama will talk about “no nukes” until he finds a more satisfying idea on which to hang his foreign policy. And if it didn’t, all that goodwill, so much in evidence last week, might well go to waste.